candy – What's Cookin' @ Special Collections?! In the days before brightly colored bags of candy in store aisles, candy-making was a home activity. It took a set of tools, a set of skills, and, based on my own limited experience, a great deal of patience. And, since I’m certainly no expert, we’re revisiting an authority on many things in the late 19th/early 20th century, Sarah Tyson Rorer (see previous posts about her here and here). In 1889, Rorer’s Home Candy Making was published. It wasn’t the first manual of its kind, but it is one of the earliest volumes we have in Special Collections specifically dedicated to candy-making. Candy in the pre-mass-produced era usually fell into some standard categories which had a lot of variation within them. You’ll commonly see creams, glacés, nougats, caramels, drops (essentially hard candies), and taffy. Following the table of contents, Rorer’s book has a few general rules for candy-making, which, if you delve into candy-making today, still hold true. Unlike some aspects of cooking and techniques, home candy-making today is pretty much the way is was 100+ years ago and not all that different from candy-making in previous, except maybe for the addition of the candy thermometer later on. 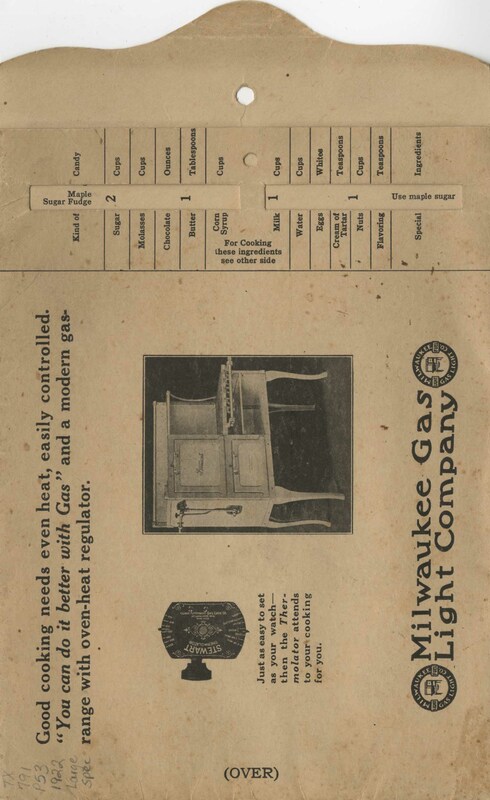 The book includes directions for making colorings at home using ingredients, as Rorer specifically advises against what she calls “colorings of commerce” (in other words, commercially produced ones). Her colors rely on an array of ingredients from just sugar and water to saffron, spinach, and cochineal. On a side note, at some point, someone stored a newspaper clipping in this volume, causing one of the pages to discolor–we see that a lot in Special Collections! A few sample recipes from the section on cream candies and confections, including those flavored with coffee or tea, and those filled with fruit. 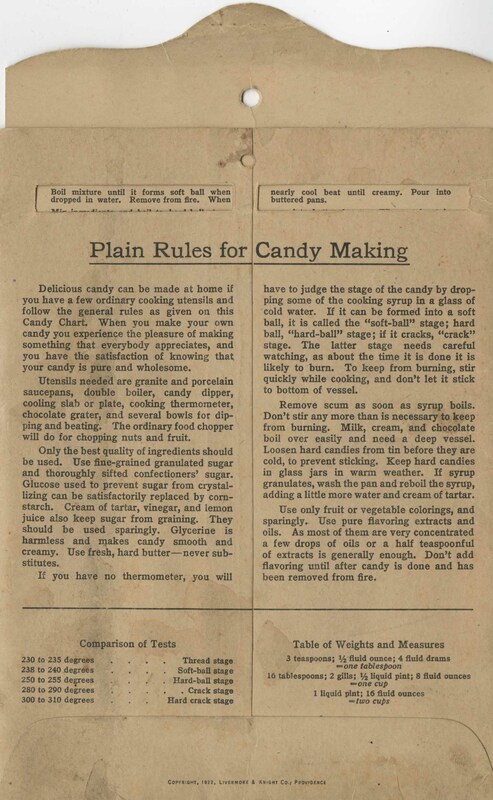 Some recipes from the section on taffy, which also includes candies using molasses and, interestingly, a recipe for cough drops. In addition to more taffy and some fruit caramels, these pages also include a recipe for “chocolate chips.” These are a far cry from the chocolate chips we so often use for cookies today. Rather, they are a brittle hard candy coated in chocolate or chocolate fondant. Toward the end of the book, there are about 10 blank pages labeled “Additional Recipes.” The idea, of course, is that home candy-makers would record their own recipes. As Rorer points out in the section on creamed confections: “This class is without limit if one has any inventiveness; one variety seems to suggest another.” But that inventiveness can be applied more broadly to all the categories in the book–once one has practiced and mastered the techniques, of course. Sadly, the previous owner(s) of our copy did not include an original recipes. The Tiny Book of Candies (1907) measures just over 2 inches (5cm) in height (paperclip for scale). It’s surprisingly readable and is part of a series of five “tiny” books, of which Special Collections has almost all. Special Collections has close to 50 books in the culinary collection that are devoted to the topic of candy and confections. Beyond that, we have hundreds of recipe books and other materials that touch on the subject to vary degrees. So, whatever you sweet-tooth, we probably have something to satisfy it for this Halloween and every other time of year. With the holidays just around the corner, fall and winter baking season is here! (It’s baking season almost year round if you’re me, but this time of year can be especially popular.) And, in the past, we’ve talked a fair bit about flour and baking powder on the blog, but we haven’t said much about another staple: sugar! The National Sugar Refining Company of New Jersey isn’t called that anymore. It has long since become part of a larger company. But you might still see Jack Frost on a package or two, depending on where you live, continuing to bring you granulated sugar for all your goodies!